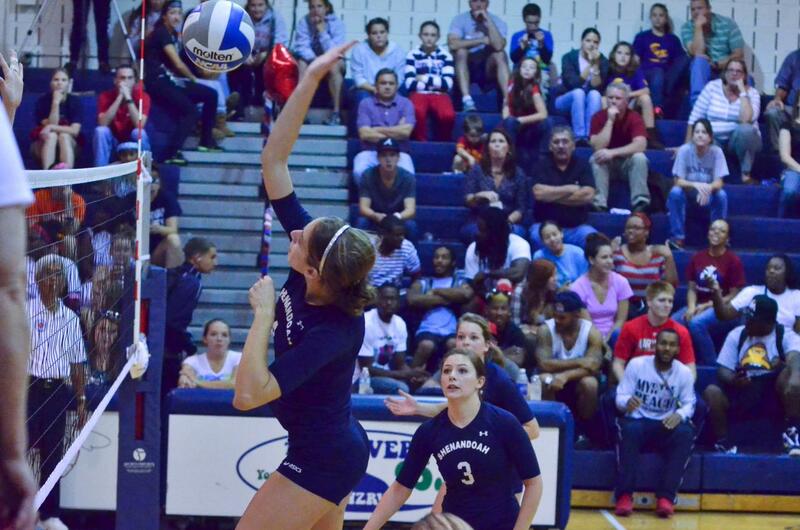 The Shenandoah University volleyball team hasn’t played many home games to start off their 2014 season, but the ladies have gotten off to a strong start despite the majority of their games thus far taking place away from Shingleton Gymnasium. The women are off to a 8-3 and nine of their first eleven games have taken place outside of Winchester. In fact, the team hadn’t played a game in the state of Virginia until Sept. 13 in their home opening matches against Guilford and Messiah. Eight of their nine away matches they have played have taken place in Pennsylvania, and the other one took place in Maryland. The Hornets’ strong start isn’t a surprise to anyone on the team; they feel they have a better team both in terms of talent as well as chemistry compared to last year. As of Sept. 12, the Hornets have multiple players in the top five among the conference leaders in a number of categories. According to the official ODAC website, freshman Elizabeth Lamont is fourth in hitting percentage, while fellow freshman Brandi Griffith is third in digs and fourth in digs per set. Sophomore Rachel Cerretani is second in assists and third in assists per set, while fellow sophomore Rachel Roberts is fourth in total blocks, blocks per set and block assists and also ranks fifth in solo blocks just behind junior Allie Pieper. Senior Rachel Gross also had a great start to her final collegiate season as she ranks fourth in service aces. With so many of the ladies having such strong starts, it is no surprise that the Hornets have one of the best overall records of all of the ODAC teams so far. Heading into this season, the other coaches in the ODAC felt S.U. would be improved compared to 2013 and picked them to finish eighth in the conference in their annual preseason poll. That’s where the team finished last year en route to their first ODAC Tournament appearance. The ladies exceeded expectations last season as they were picked ninth in the preseason poll, but the team isn’t content with how last year ended with a first round loss to eventual tournament champions, Washington & Lee. They plan on building upon the strong start they’ve gotten off to and hopefully finish in the top four in the conference, so they earn the privilege to host a first-round playoff match in November. The ladies have a number of upcoming home games, and they would like nothing more than to see Shingleton filled to max capacity for those matches. They take on rival Bridgewater on Sept. 19 at 7 p.m. and then host Eastern Mennonite the following morning at 11 a.m. They also welcome in Marymount on Sept. 24 in a 7 p.m. contest. All home games are free when you show your S.U. ID card at the ticket table at the lobby of Shingleton Gymnasium or from the Aikens Athletic Center side. Come out and support the S.U. volleyball team as they look to continue their winning ways!